Joerg Schaefer and Gisela Winckler, geochemists and paleoclimatologists at Lamont-Doherty Earth Observatory, were awarded funding from the Center for Climate and Life to examine the vulnerability of Greenland's massive ice sheet. The research builds on their previous work, in particular, a 2016 Nature study led by Schaefer that indicates the Greenland ice sheet almost completely melted at least once in the last two million years. The finding suggests the ice sheet is much more unstable than scientists previously thought. Their new project uses analytical tools they've developed to directly evaluate the past variability of the Greenland ice sheet. The results of this research will contribute to improved predictions of global sea level rise and how it will impact society. Q. What is the general focus of your research? Joerg. I'm the head of the Cosmogenic Dating Group at Lamont. My research program looks at the correlation between climate change and cryospheric change, from ice sheets and mountain glaciers to the impacts of sea level change. We do this globally, looking into climate variations and how glaciers reacted, from the Arctic through the Alps, the tropical Andes, the Himalayas, South America, and Antarctica. We try to understand how ice responded to temperature changes in the past so we can calibrate the sensitivity of it and then better predict what's coming in the future. Gisela. I lead the Noble Gas Lab at Lamont. We make cosmogenic isotope and other measurements to reconstruct past changes in the climate system. In addition to looking at questions about dating and ice, I do a lot of work reconstructing paleoclimate and environmental conditions in the past using archives that can tell us about the past, such as exposed rock surfaces, marine sediments, and ice cores. Q. What's the problem you're trying to address with your Climate and Life funding? G. What this recent Nature paper shows is that the Greenland ice sheet, which the scientific community kind of thought is a stable system — in comparison to the West Antarctic Ice Sheet, for example — is not actually that stable. 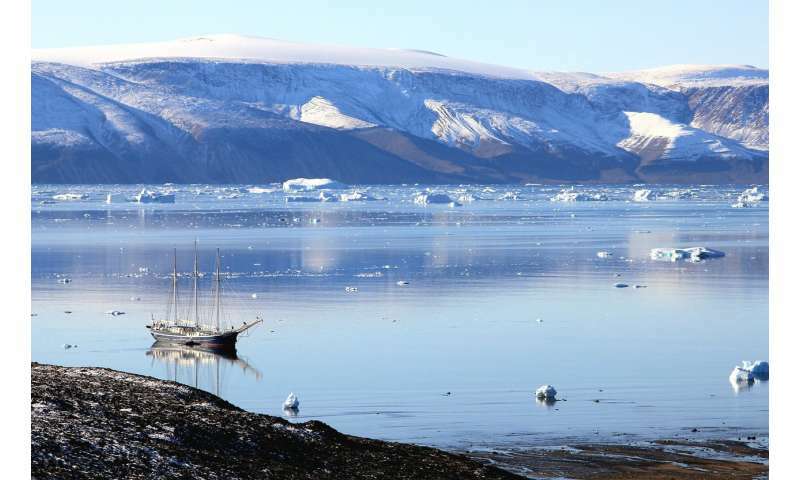 There is indication from the paleoclimate record on longer timescales of climate change from the last million years or so that there is a real threat of significant melting of Greenland. J. The Greenland ice sheet has the potential to melt faster than any other ice sheet. But at the moment the Greenland ice sheet doesn't play a significant role in any sea level projections and that has to be corrected. That's the bad news. The good news is that with the new toolkit we've developed, we can answer questions like: Which are the weakest elements of the Greenland ice sheet? Which areas of it will melt first? Where should you monitor first? And you can also say what the rate of change may be. So this work is really urgent and also really promising. Q. Tell me more about the new toolkit you'll apply to this problem. J. Gisela and me run two of the key geochemistry labs at Lamont. Together we are the only facility worldwide that can make high-sensitivity measurements of seven relevant cosmogenic nuclides. These are isotopes produced by the interaction of cosmic rays from the sky with the nucleus of certain atoms. We use analytical techniques to measure them as a function of time—it is really just a measure of time that a surface is exposed to the open sky. Cosmogenic nuclides in the bedrock beneath ice sheets can tell us about periods of ice-free conditions because only cosmic rays directly hitting bedrock produce these nuclides. Our new tool combines several of these nuclides of different half-lives, or ideally a stable noble gas with a radioactive nuclide, to reconstruct the history of ice-free conditions underneath the ice sheet. From these data sets, we can learn, for example, when in the past some area of bedrock was no longer covered with ice and exposed to the air. So we can now know when in the past there were periods of ice sheet collapse and periods of ice sheet existence, which is one of the key questions scientists want to answer. We have this rare core sample of bedrock collected from underneath the Greenland ice sheet summit, which we used in our 2016 study. Now, with this new Climate and Life funding, we'll measure two different cosmogenic nuclides in the same core. We'll also make high-sensitivity measurements of all the nuclides of interest on two new core samples collected from southwest Greenland and the northeast Greenland ice stream. This work can help us track the kind of retreat the Greenland ice sheet had. We'll be able to point to the weaknesses of the ice sheet, so you can even talk about an early warning system. If you know where a weakness is, you can monitor it and see when the area starts collapsing. You can also answer questions like, for example, in Greenland where will the first foot of sea level contribution from the ice sheet come from? Q. How might this project advance understanding of the challenges posed by climate change? G. This project looks at what we think is one of the key challenges of climate change, and that is the threat from sea level rise. There's sort of a consensus that this is one of the most important impacts, and not just because it poses so many risks to infrastructure and cities that have buildings along the coast. In fact, it's a challenge to everybody on this planet because of these ripple effects of sea level rise like forced migration and the destroying of ecosystems, habits, and also whole regions where people live. And in a shorter time than we hope, everybody will feel the impacts of sea level rise. J. What we'll get out of this scientifically is, almost certainly, we'll increase the sea level predictions for Greenland and therefore for the globe, and consequently reduce some of the uncertainty associated with the current predictions. What we can deliver through this project is a better framework for what the sea level problem actually is and what the problem will be in the next 50 to 100 years. So we'll do this work for Greenland, then eventually we have to do it for all of the world's ice sheets. The good news is that we can put forward these really robust understandings of these ice sheets, how sensitive they were, and how dynamic they were, and are, at the moment. We can really make a quantum leap in our understanding of them. That's the goal for the next 10 years. Q. What do you find most exciting about this work? J. As a scientist, the urgency and the novelty are most exciting. We have a completely new archive to look into that basically guarantees that we will find really important information, whatever that information may be. And we have developed these tools — the keys to open the safe. That feels like an archaeologist finding a grave and being the first one to look inside it. I've done basic research my entire life and this is the first time it's so directly connected to the consequences, to society. It's important that institutions and frameworks like the Center for Climate and Life exist right now. Climate change is so obviously a completely interdisciplinary problem and the more experience you gain as a scientist, the more interested you become in actually connecting to the solutions side and the Center helps us do that. G. I agree. It's by far the most relevant thing I've ever done. I think it really matters. And it opens up this connectivity to all these problems that are at the heart of the Center for Climate and Life. The more I understand these problems, the more I'm interested in working on such issues and getting the word out. And contributing the little bit I can as a geochemist to figuring out climate change and maybe even to coming up with solutions. Q. When it comes to finding solutions to climate change, what gives you hope? G. My hope is in the young generation. People who are in high school or college today have the power to figure this out. When I teach or work with organizations like the Climate Museum, for example, I talk to young people and they give me glimpses of hope. And I think these very bright students will be the ones to figure out this problem and once they do, that will trigger so much more initiative and lead to solutions. J. Another perspective on that: I would say the ice changes are the most dramatic and academically valuable, and kind of a poster child for climate change education. And while these changes are happening we are educating the next generation of students and young scientists. These people will see change to a degree that is just mind-blowing and that will contribute to the motivation of this next generation to do something about it. Q. Do you have a favorite book about climate change? G. I really like a book by David Archer called The Long Thaw. He's a brilliant educator and he writes really well about the science of climate change.